This giveaway is now CLOSED. Thanks so much to our wonderful sponsor SodaStream! We look forward to working with you again! The winner has been notified and upon confirmation, follower name will be posted both here and on our homepage. Remember: There are great giveaways active on the upper right hand side of the page! Does your Dad derive tremendous satisfaction from Do-It-Yourself projects? Does he like Gadgets? Does he just love making his family happy? If your Dad (uncle or Grandpa) still calls Soda 'Pop', or remembers the 'Soda Fountain' then I've got the perfect gift idea for him! Ƹ̵̡Ӝ̵̨̄Ʒ - SodaStream offers a wide variety of styles and colors to match any kitchen decor. Ƹ̵̡Ӝ̵̨̄Ʒ - Prepare great-tasting, fresh, fizzy beverages precisely to your taste - with no bottles, cans, electricity...and no clean-up. Over 30 flavors at the touch of a button! Ƹ̵̡Ӝ̵̨̄Ʒ - 30-day money-back guarantee. Ƹ̵̡Ӝ̵̨̄Ʒ - two-year manufacturer's warranty on all new soda makers. Ƹ̵̡Ӝ̵̨̄Ʒ - Automatic access gas release mechanism. It is as easy to use as making a cup of coffee! Ƹ̵̡Ӝ̵̨̄Ʒ - Customized carbonation level. Ƹ̵̡Ӝ̵̨̄Ʒ - Easy to clean drip tray. You might remember that in 2009 we reviewed the Sodastream Penguin Soda Maker and it was love at first Soda! I still have my penguin and 2 years later it works like new! I only mention this because for me durability is very important, when I spend money I expect that item to last. Most of us want quality and value at a good price, and Sodastream truly delivers! So you wonder? Why did you review the Genesis? While I love my Penguin and it's not going anywhere, I actually wanted the ability to make more soda per use and the Genesis has a bigger batch per use capacity than the Penguin does. But just like the Penguin, it is SUPER easy to set up, use, and maintain! I love being able to make bigger batches per use, I love the drip tray, and I love the slimmer profile as I do have a small kitchen. This year I've been making small Lifestyle changes that have added up to yield major results. Without drastic changes I have dropped 26 pounds, and Sodastream is one of the tools in my arsenal. I am never going to become a fanatic, I love life, I love food and I love my Soda! I'm NOT giving it up entirely, but Sodastream allows me to still enjoy my soda with reduced levels of sodium, carbs and caffeine. The comparison between popular brand sodas and sodastream are really dramatic, please refer to this chart for more info HERE. Based on my level of Soda Consumption I can't even begin to explain just how much I've saved using Sodastream, not to mention the mix is lighter to carry than standard 2 liters and as I live in an Apartment, it's definitely helping my back not carrying those heavy bottles anymore. I love being able to customize the intensity of the flavor as well as the level of carbonation and variety of flavors! My personal fave flavors include (it's truly like having a soda aisle in your pantry) : Cream, Cranberry Raspberry, Dr. Pete, Lemon Lime, Orange, and the traditional Cola flavor! Ƹ̵̡Ӝ̵̨̄Ʒ - WIN IT! - Ascending Butterfly and our friends at SodaStream have a very special surprise for 1 lucky winner! 1 winner will win a SodaStream Genesis for their Dad, or to keep for themself! Don't you just ♥ SodaStream? I know I do! Ƹ̵̡Ӝ̵̨̄Ʒ - How to Win: (1) You must be a PUBLIC follower of Ascending Butterfly to be eligible for this and all giveaways. Indicate in your entry that you follow (if your 'comment name/user id' differs from your profile id, please let me know what name you follow under) and (2)MANDATORY entry- Tell us who this will be for, Will you give it to Dad, your Hubby, Brother, Uncle, (or will you keep the SodaStream for yourself)? (And while we never make social media follows mandatory, I'd love it if you followed SodaStream via Facebook or Twitter, see Extra Credit Section for more info and direct links). (3) You must also leave your email address somewhere in your comment. (You can format it this way for security, example: ascendingbutterfly AT mail host DOT com). (If your email is clearly visible in your profile, you can just say so, that's OK!) Please follow the easy 1, 2, 3 steps to winning (or in this case, the A,B,C’s of winning!) This giveaway is open to USA residents who are 18 years of age or older. No PO Boxes. One entry per Household, see Ascending Butterfly Giveaway Rules and Disclosure Policy HERE. Dad always taught me to be independent and learn to do things on my own. I am following (Maria BearMountainBooks--picture of the little bear). I follow you on GFC(kellyr78) And I would give this to my dad. I would give this to hubby the pop addict. My father told my mother that it made no sense to send me to college because like his other daughters I would come back pregnant and never finish school. That just made me so mad I had to prove him wrong. I now have my bacherlors and masters degree and I did not have kids until I was married. I'm a public follower. I would give this to my husband. Since I don't have a dad, hubby, brother and my one uncle is 84 and doesn't drink soda, that leaves me! So, I will gladly keep it for myself. This would be for my husband who drinks a lot of soda pop. This would be a great way to reduce the amount of cans we put in recycling each week. i would give this to my hubby he is a soda addict and i would love for him to have a better less exspensive way to enjoy his pop. gfc friend (Beth Elderton)This would be for my good husband! I think we would keep this as a family. Before I was married and I was dating, if I was frustrated by a breakup, my dad would always tell me that boys were like busses - another one would come along any minute! 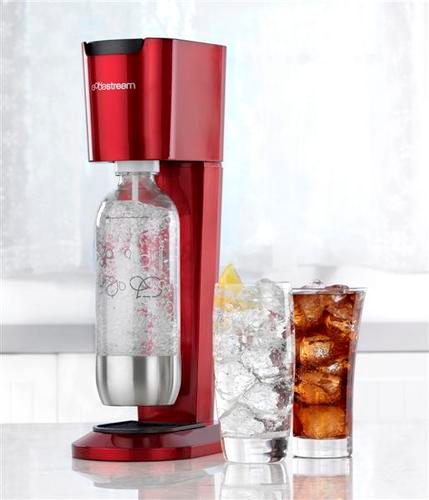 -The Sodastream would be for my husband, to give him a healthier alternative to buying soda. My fathers advice was....Always take care of your family first, they will be the ones who are always there for you. this would totally be for me. im greedy and love soda. I follow with GFC, SelindaM. I would give this to my husband! and this will be for both me and my husband, we love our fizzy water! my father used to always tell me that is i was going to goof off in school by reading (i always finished my work early, and if you were done you weren't allowed to read) that i should be caught with only classics. since i finished early a lot, i developed a deep love for classical literature. I follow with gfc as degood and I would give it to my husband if I won. The best advice my dad gave was treasure every moment with your kids because the days seem to go on forever but the years go by so fast. I follow ascending one on twitter as kmayans. I follow soda stream on twitter as kmayans. The SodaStream would be for our whole family. entered Shenzhen Chefs Knife Giveaway! I follow via GFC! What an awesome giveaway! I would give this to my husband. He along with my kids are soda junkies! I like Soda Stream on FB and commented! I publicly follow your blog with GFC as Theresa. I would love to keep this for myself. I follow Tracy Iglesias on twitter(terri142). I am now following Ascending1 on twitter(terri142). following via GFC- I would give this to my boyfriend! I'd give it to my step-dad and my mom. They always complain how soda is too expensive so this would be great for them, and of course the grand kids when they are over.